When my daughter was a child of four she carried two stuffed animals with her wherever she went. One was Maui Bunny that arrived one Easter morning in Ka‘anapali, and the other was Forest the Bear – “Forest was a Chicago Bear, a Chicago Bear because he came from there.” She was soon to discover that in order pick anything else up she’d have to put one of the two down. So for quite awhile she passed by many new opportunities. And so it goes with my reading preferences. My Maui Bunny and Forest the Bear are Bob Lee (Bob the Nailer) Swagger and Jack Reacher. Whenever Stephen Hunter or Lee Child release another chapter in these long running series, everything else is left sitting on the shelf. I just think I may have to set one of them down and pickup someone new. Why, Court Gentry of course! 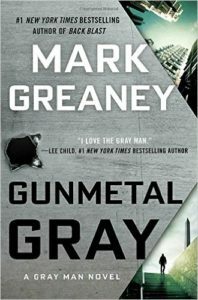 None other than Mark Greaney’s Gray Man. After four successful outings, The Gray Man took a jump from paperback format to hardcover status with last year’s BACK BLAST, and returns again in GUNMETAL GRAY. Court Gentry is The Gray Man—disavowed by the CIA after a mission gone bad, Gentry has become a legend in the covert realm, quietly navigating the globe – from job to job. He tackles the tough assignments, accomplishes the impossible, and then slips away undetected. For years Gentry was marked with a kill order by the CIA, slipping through their numerous attempts to take him off the board. In BACK BLAST his reputation and place within the agency are restored as he uncovers how he went from the highest respected operative to the highest valued target. In GUNMETAL GRAY Gentry takes on his first job since being restored to the agency. Now an operative-for-hire, he sets out to find Fan Jiang, a cyber expert, who has recently walked away from his Chinese handlers. His high stakes hunt takes Gentry across Southeast Asia to Hong Kong finding his old friend and boss, Donald Fitzroy being held hostage by the Chinese. 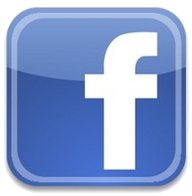 Fitzroy has been hired by the Chinese to find Fan so that the Chinese can silence him before he aligns with the West. When Fitzroy’s first two agents disappear, Gentry is pulled in to finish the job, with Fitzroy’s life held in the balance. Racing against the clock, the Chinese and a Russian Special Forces team set on finding Fan first, Gentry faces his most challenging mission. Mark Greaney’s is also known for the seven Jack Ryan novels he wrote working with Tom Clancy. 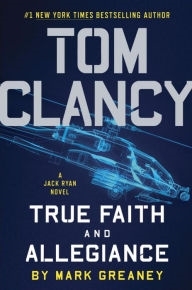 Greaney recently announced that TRUE FAITH AND ALLEGIANCE (2016) is his last book for Clancy, as he will be focusing on the Gray Man franchise. Court Gentry will reappear next year in WEAPONIZED. Listen as Mark Greaney discusses his books with Rodger Nichols on BlogTalkRadio’s MODERN SIGNED BOOKS. Regardless of who you may have to put down, it is definitely time for you to pick up The Gray Man! We occasionally find ourselves receiving advances from publisher – it’s one of the small perks of book selling. On Friday I was pleased to find a copy of BACK BLAST by Mark Greaney. I recently told you about Greaney moving into hardcover with this upcoming title, but risk repeating myself by telling you one more time that this is a book you’ll want to read.